UBER is now available in the Poconos. Download the app. Make your car reservation. Arrive by bus at a Poconos Bus Station and your private driver will deliver you to your resort destination. We tried it and it was a wonderful experience. This page is about Getting to and From the Poconos By Bus. Please check Poconos Hotel Reservations or the reservation system below for hotel rates and availability. Taking the Bus to the Poconos for Vacations - Call Poconos Reservations for instructions on how to get from the Bus Station to your hotel. Some hotels will send a car and, for some, you take a Taxi or UBER. Pocono Mountain Bus Tours Poconos Reservations can help Tour Guides find the right hotel or facility for your bus stay over. -Depart From Atlantic City, NJ goes to Scranton & Wilkes Barre then to your chosen Poconos Destination. Pocono Palace: Bus Lines to call for transportation information: Greyhound or Martz bus lines will bring you to the Delaware Water Gap Depot in PA. A courtesy van will meet you at no charge. Call the number listed on your email confirmation upon arrival to the depot. Paradise Stream:Bus Lines to call for transportation information: Greyhound or Martz bus lines will bring you to a depot in Mt. Pocono, PA. Our courtesy van will meet you at no charge. Call the number listed on your email confirmation upon arrival to the depot. Cove Haven: Bus Lines to call for transportation information: Shortline buses from New York City, will bring you to a depot in Hawley, PA. A courtesy van will meet you at no charge. Call the number listed on your email confirmation upon arrival to the depot. 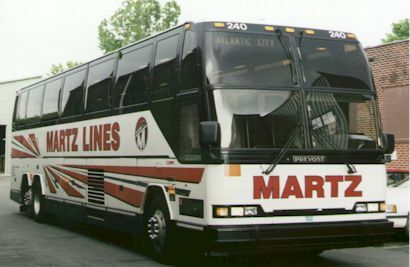 Martz is located & operates service from Wilkes-Barre, PA-Scranton, PA-Philadelphia, PA-New York City, NY-Washington, D.C.-Richmond, VA-Orlando, FL-St. Petersburg, FL-Atlantic City, NJ to points in the United States & Canada.